The field of nano-particle research encompasses researchers from chemistry, physics, and in recent years also biology. A nano-particles is defined as a particle with a diameter smaller than 100 nm; although larger particles are often also counted as there are no hard and fast rules. Most nano-particles are grown using chemical techniques where a range of chemicals are mixed together and seeded to start the growth of solid material, in the same way that crystal can be grown. The size and composition of the particles can be controlled by adjusting the initial materials and the time of the reaction. The figure opposite shows the size range of zinc-oxide particles grown in this way. The black and white inset photo is a transmission electron image of these 20 nm particles (about 5000 times smaller than the width of a human hair). There are many reasons for making nano-particles. In the case of zinc-oxide the primary drive is in the use of sun screens and cosmetics - zinc oxide is very effective at absorbing UV light, but as a slab of material it is no use to anyone. By growing it just as tiny particles it can be mixed in with oils and creams so it can be applied to the skins surface, but still maintains the ability to absorb UV light. One of the biggest problems with all nano-particle research is shown in the right of the top figure. When the nice images of the particles are zoomed out we find that nano-particles like to clump together in aggregates; in this case the zinc-oxide particles groups into balls about 200 nm in diameter, 10 times the size of the primary particle. The reason for this is that most solid materials are happiest when their surfaces are as small as possible. When made into nano-particles materials are forced to have very large surface areas, these often contain electric charges, and the net result is a weakly attractive force that loosely binds the particles together. This effect stops the particles evenly distributing, and so stops them being of use in most applications. To stop this aggregation a blocking layer must be set up between particles, either, as in the case of sun creams, by suspending the then in an oil (such as coconut oil), or by a more involved process of attaching other molecules to the surfaces of the particles (see the bio-conjugation section). The research in this section is primarily interested in the interactions between nano-particles and skin tissue. Current sun creams that contain zinc oxide use particles of many nanometers in diameter, which are known not to enter the skin, and hence are safe to use. However, there is interest in just how small particles can be made before they will start to penetrate the skin, smaller particles can have better properties and could also provide a better coverage. The challenge is observing the interactions between trillions of nano-particles and complex skin tissues to such a level that useful conclusions can be drawn. A useful property of zinc oxide is that it is very efficient at a process known as two photon absorption. This process allows two low energy red photons of light to be absorbed and be converted to one high energy blue photon. Very few materials can perform this trick and it is this that allows us to investigate the interactions of zinc-oxide nano-particles with human skin. The problem with nano-particles is that they are small, so cannot be viewed unless they are very carefully prepared, like in the top image. Under nearly all circumstances other things will look much brighter than the particles themselves, and this is why the two photon process is so useful. Taking a normal fluorescence image of a piece of human skin produces the pink part of the image, right. This is a layer of skin taken from a patient after liposuction. The black line is drawn on to show the surface of the skin and the sample is produced in such a way that points below the line are getting deeper into the skins surface. 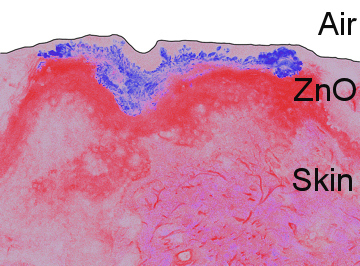 The bright pink region is the live skin and the faint part just under the black line is the layer of dead cells that make up the actual surface of the tissue. Such an image cannot see the zinc-oxide particles as the skin appears quite bright. However, if we shine red light on the tissue and just look for blue, the blue part of the image can be taken (the two image are then combined to form the one here). This trick allows the position of the nano-particles to be observed on the skins surface. Using the same microscope that took the above image, many different concentrations of zinc-oxide can be imaged by themselves and this information is used to build up a calibration chart that allows us to quantify the number of particles needed to produce pixels of a certain brightness. 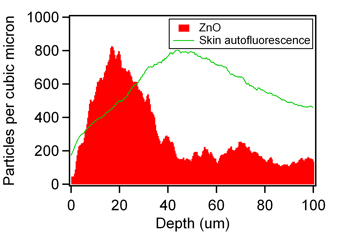 The is shown in the graph, right, where using the image above, from every point along the skins surface a line has been taken into the tissue and the brightness of the zinc-oxide recorded. This is averaged along the whole length of skin (shown in the image and extending further in both directions) and then calibrated to produce the actual numbers of nano-particles at each depth. This data indicates that the vast majority of particles are confined to the top 30 microns of the skins surface, and so are not penetration the skin. Further analysis reveals that the particles that do appear to have penetrated the skin are from regions where the skin was damaged, and hence gives the impression that the particles had penetrated. This information thus indicates that the particles cannot penetrate the top layers of skin, and hence are safe to the user. This technique can be repeated for different particle sizes and nano-particle surface coating as well as using skin under different conditions (such as when makeup has been applied) and be used to provide quantitative estimates for the penetration of particles through the skins surface, and hence infer the safety of particles in each scenario. Z. Song, T.A. Kelf, W.H. Sanchez, M.S. Roberts, J. Ricka, M. Frenz, and A.V. Zvyagin.